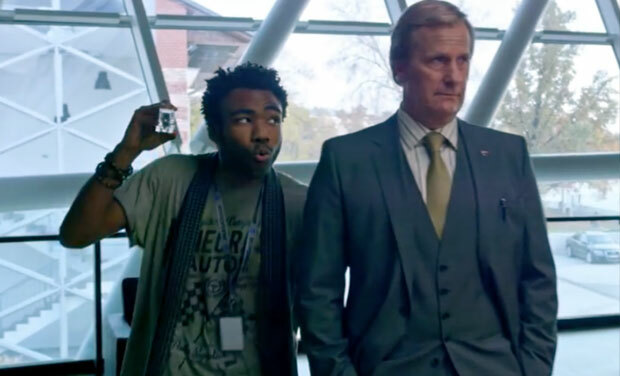 Is This The Most Fun “Hard-Science” Film You’ve Been Waiting For? Jim Tudor: With NASA essentially grounded, we’re a long, long way from reaching Mars. Thankfully, we have cinema, which now offers to take us there, via the travails of Matt Damon. 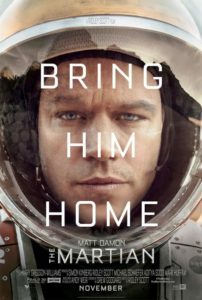 In The Martian, the new film based on the popular, science-centric book by Andy Weir, Damon plays botanist Mark Watney, an astronaut on a mission to Mars who suddenly finds himself stranded there alone after his crew abruptly takes off during a major storm that leaves him presumed dead. Just as we exited “Jurassic Park” all those years ago feeling that we had finally experienced the sight of real dinosaurs, we leave “The Martian” feeling as though we have just spent a lot of time on the red planet. 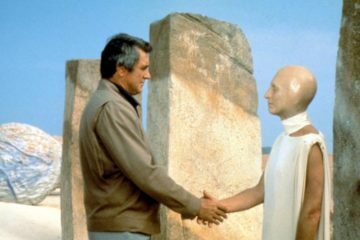 It’s certainly not the first film to take place largely on Mars, but it’s the first that feels as though it was filmed there. That alone might be reason enough to make a point of checking out The Martian. But in case a two hour-plus partial travelogue of a desolate planet sounds a little dry, know that the movie features a lot more to behold. The Martian, a space-faring movie directed by the sometimes stern, sometimes disconnected visualist Ridley Scott, and based on a book that is widely purported to be driven by hard science, is (you may want to brace yourself) a fun and persistently engaging crowd-pleaser. I know, I’m as surprised as anyone. For years I’ve been lamenting the fact that Ridley Scott, the once-great director of vital films such as Alien and Blade Runner, hasn’t, for a very long time now, lived up to the promise of being Ridley Scott. Exodus: Gods and Kings, Robin Hood, and A Good Year are just some of the snooze-fests he’s helmed post-Gladiator, which say nothing of the curiously glaring failures of films such as The Counselor and Prometheus. Although he could still score large-budgets and prime casts, artistically speaking Scott was as lost as Mark Watney. As a former fan and cinephile, I’d all but given up, working harder and harder to hope against hope that he had one more great film in him. The Martian, to my joyful astonishment, is that movie. With an effectively lightened touch, spirited tempo, and an unblinking focus on “process” (this could’ve been a very different but also very interesting David Fincher film) this reveals a welcome side of Ridley Scott that we’ve never seen before. 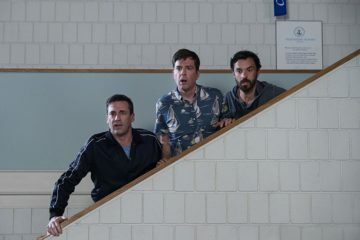 Perhaps a cast of comedy-savvy actors (all of whom click brilliantly) and an amazing screenplay by Drew Goddard (Cabin in the Woods, Buffy the Vampire Slayer) was all he needed. In any case, The Martian isn’t just the best film Scott has directed since Black Hawk Down, it’s the first good one. And, it’s Great. That’s my opinion, anyhow. Erik Yates: I’m in complete agreement with your opinion. I was surprised by how funny this film is in the face of the “hard-science” reputation the book has. 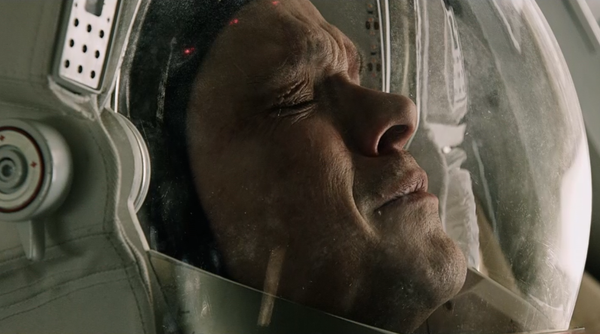 The situation that astronaut Mark Watney finds himself in is tense enough. So having enough humor to show the enduring human spirit in the face of difficulty was important for the characters sanity, but also for our ability to sympathize with him and actually have some emotional investment on his eventual fate. The supporting cast is absolutely terrific as well. It boasts the talents of Jessica Chastain, Kristen Wiig, Kate Mara, Sean Bean, Sebastian Stan, Donald Glover, Jeff Daniels, Chiwetel Ejiofor, and Michael Pena. It may be one of the best ensembles of the year, and each is given the opportunity to shine. They also lighten the tension as well. One memorable scene involves Sean Bean (Boromir in The Lord of the Rings trilogy) being present as two NASA employees argue about the council of Elrond in The Fellowship of the Ring and him having to settle the debate as his Martian character, Mitch Henderson. As to the issue of “hard-science”, those who are worried that it will weigh down the story and get you lost in the details have no reason to fear. This film is much more user friendly than the quantum physics being discussed in last year’s Interstellar. 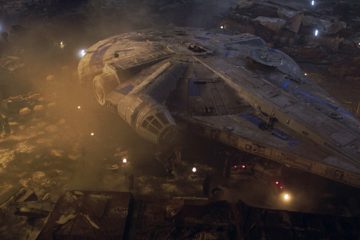 The science aspects of this film, through Scott’s direction, the script, and Damon’s believable portrayal, are able to create a believability to the story that draws you in, despite the science-fiction of it all since we currently do not have the ability to travel to Mars as is depicted here. I am writing to you from Space City, Houston, Texas, and the screening crowd recognized a lot of the places in the film regarding Mission Control and the Johnson Space Center. These type of real-world details blended perfectly with the artificial cinema world of Mars to create the most believable depiction of the Red Planet, and its relationship with ours, we have seen ever on film, as you mentioned Jim. As to your point on Prometheus, I think this gives me much more hope for its sequel if Scott can even things out in terms of storytelling and aesthetics of the worlds he creates. For this, all cylinders were firing at the same time and so we have a very good cinematic experience all around. I saw the film in 3D, and must say that while the 3D didn’t necessarily have a huge impact in terms of film experience, it was a very good use of a subtle effect that helped bring the Martian landscape, and the space scenes in general, into a richer focus that added to the believability we’ve been mentioning. There was simply more depth (different than the depth the name 3D implies) to the world we were experiencing which grounded us firmly in the story they were trying to tell. That being said, I think a 2D experience wouldn’t suffer in terms of seeing the story play out on the cinema screen. Jim Tudor: True, insomuch as any really good 3D movie would also play well in 2D. The Martian is a film worth catching, one way or the other. I say that not only in terms of its entertainment value, its magnificent visual absorption, or the chance to witness one of our most prominent filmmakers truly return to greatness. I say that because all of the above factors are clicking in support of the film’s metaphor, one of our central isolation from one another, and how important it is to work together to help each other in times of need. Such need can be physical (the ticking clock aspect of whether Watney will be able to keep himself alive long enough for NASA to implement a rescue strategy) and spiritual. Although human connectivity is rampant, feeling hopelessly internally cut off by technology and/or nature is all too common a feeling. At one point, Watney must whittle a wooden crucifix to burn for warmth – a major religious metaphor among a book load of science process. He even takes a moment to talk to Jesus. He also talks to the potatoes he’s growing, and spends much time talking to his onboard computer, detailing his situation as much for our sake as his own. The wonder of The Martian is that it manages to communicate its ideas without clobbering us with them. Again, the altogether lighter touch of the screenplay is a grand achievement. Erik Yates: It is able to communicate some grand ideas without forcing its points. The notion of science and faith being afforded a seat at the same table is refreshing for a change where so often they are pitted against one another. This allows us to simply see both as different sides of the human experience. Damon’s depiction of Mark Watney is definitely a man of science and certainly uses every aspect of science he knows to survive. Botanists take center stage in this science-fiction film, but so does chemistry, physics, geology, and more. But the need to believe and have hope against the odds, and certainly in the face of insurmountable odds is equally important…especially when one is isolated from others. Seeing that we are unable to save ourselves, and the need for community to rally around us are also deeply spiritual experiences that enhances our humanity and helps create the more believable and approachable tone that this film helps create. Jim Tudor: Another way that the approachable tone is maintained is through music. 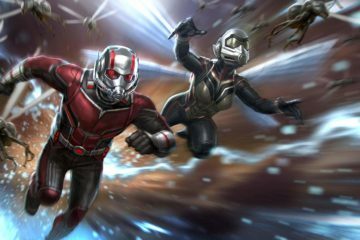 Not only is the film’s score by Henry Gregson-Williams terrific, the film also takes an effective cue from Guardians of the Galaxy in its use of an array of in-world vintage pop tunes (the only music available to Watney is his captain’s collection of disco hits, much to his constant chagrin) and a few inspired, related needle-drops. Considering that all of the prominent songs lyrically reflect what’s playing out on screen on-the-nose with on-the-nose reinforcement, it also evokes Forrest Gump‘s use of familiar tunes. The Martiandoesn’t even need this extra layer of accessibility, but it certainly doesn’t hurt to rock out a little. Consider it gravy (for the potatoes that Watney is lacking). Even the most stale and overused song selection in the film is, I begrudgingly admit, perfectly utilized. Although Matt Damon has proven himself to be both likeable and formidable on screen, I don’t know of many people who get excited enough at the prospect of a new Matt Damon movie to go out of their way to see it. 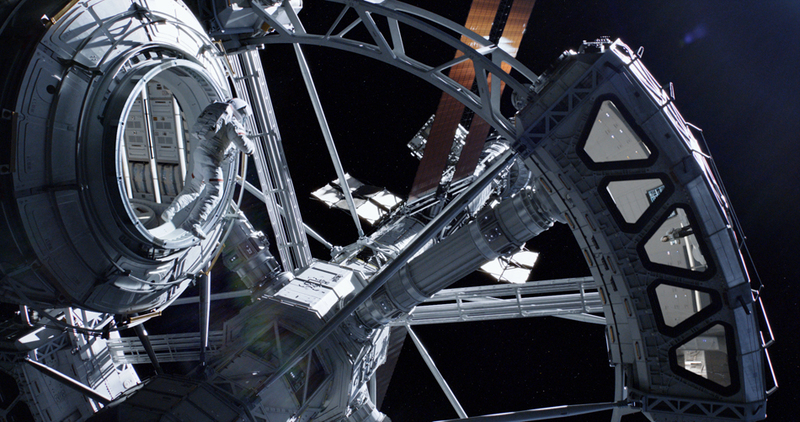 Combine that challenge of appeal with the uphill battle The Martian has in distinguishing itself from last year’s Interstellar (as Erik mentions) – another story of an astronaut struggling to get home that also stars Matt Damon in a space suit – and it’s understandable that those unfamiliar with the book might not be too keyed up to check it out. But word of mouth ought to change all of that, right quick. To miss The Martian on the big screen (and yes, Scott’s use of 3D, as it was with Prometheus, is worth it) is a mistake. Erik Yates: I agree in large part with this assessment on Damon. The biggest character he is known for, Jason Bourne, might be the only character he has played that one can truly make the claim that the movie was seen based on his presence. When Jeremy Renner tried to enter that world, it was met with a luke-warm box-office. Now that Damon is going back to that character, I think we’ll see an uptick in its stock. But as We Bought a Zoo, Interstellar, Elysium, and even Monuments Men has shown us, the films that work for Damon are usually not because of his star power, and the films that don’t aren’t necessarily because of him either. This film, is truly centered on him, despite the phenomenal supporting cast I mentioned earlier. I think that this may help him become more of a box office draw. What truly works, though, ultimately, is that a very complex story and book is able to be condensed into an approachable experience that never sacrifices the “hard science” it is known for. Instead, it simply helps create an opportunity to let people into that world and understand it at a base level through a very relatable story. That is why Scott deserves the praise for the final product of The Martian. It is why this all “clicks”. Jim Tudor: Recently in a Film Comment interview about his new film The Walk, director Robert Zemekis humorously answered a high-falutin’ question about what he perceives to be the key task in the making of his art as “Simplify the sh*t.” He’s not wrong, in that cinema is at its most effective when simplicity is smartly embraced, and visual storytelling can rule. This notion, when applied properly by filmmakers who understand the unique qualities of cinema, can result in experiences that are smart, taut, pleasing, and engaging. Ridley Scott, at age 77, has relearned this most wonderfully. This filmgoer was almost in tears of joy at one point, a minor case of Stendhal syndrome, as The Martian was clicking so well. 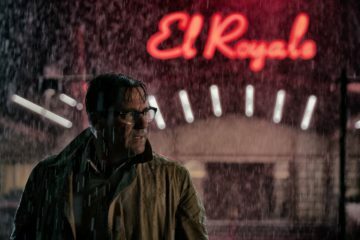 While the celebrated Cormac McCarthy proved not to be the screenwriting collaborator that Scott needed (see The Counselor – or don’t), Drew Goddard, of all people, is. His screenplay crosscuts between two planets to detail the distilled-for-cinema science at work of Weir’s novel. 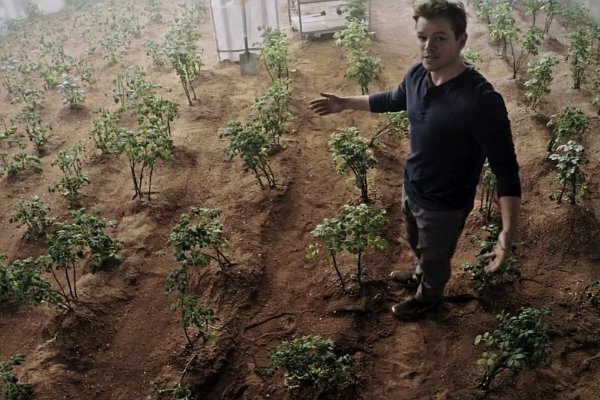 There is monumental intensity at various major moments throughout the film, but The Martian is also a movie that manages to generate real suspense from the growing of potatoes. All of it, taken together, is one of the year’s greatest achievements in this very special medium we love so much.